Geographical variation: None described. 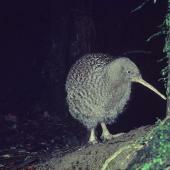 Birds in Northwest Nelson have longer mean bill length than those in the Southern Alps, with Paparoa birds being intermediate. 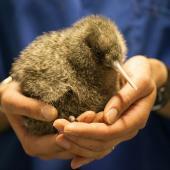 The second largest of the five kiwi species. Widespread in forest, scrub, upland tussock grasslands and subalpine zones of the north-western South Island. 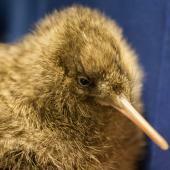 Flightless, with tiny vestigial wings and no tail. Nocturnal, therefore more often heard than seen. Male gives a repeated high-pitched ascending whistle, female gives a slower and lower pitched ascending whistle. Plumage brownish-grey finely mottled or banded horizontally with white, long pale bill, short dark legs and toes, often with dark or dark streaked claws. Large pale kiwi. Brownish-grey finely mottled or banded horizontally with white, long pale bill, short dark legs and toes, often with dark or dark streaked claws. Voice: Male gives a high-pitched ascending whistle repeated 10-20 times, female gives a slower and lower pitched ascending trill repeated 10-15 times. 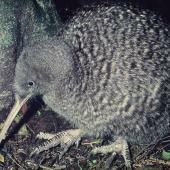 Similar species: Juvenile great spotted kiwi pass through a stage when they are similar to little spotted kiwi, but little spotted kiwi have pale legs, toes and claws. 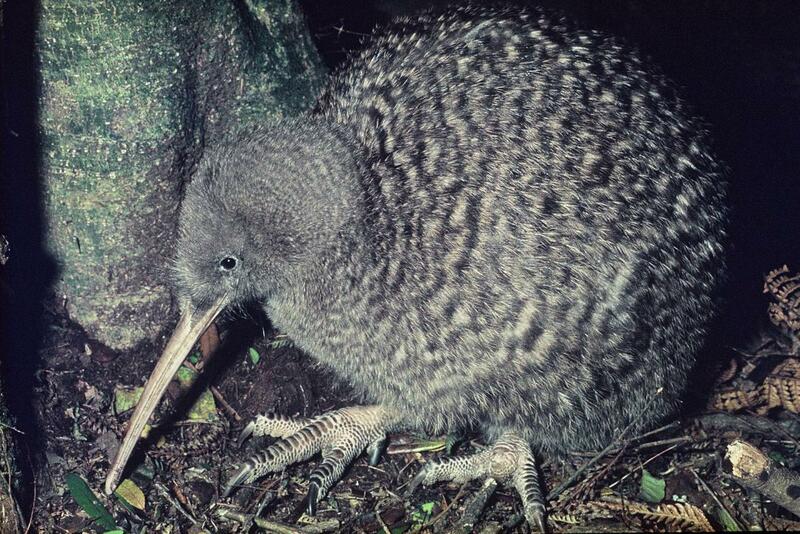 Similar to hybrid rowi x little spotted kiwi, but great spotted kiwi have much more massive legs. Widespread and locally common in forest, scrub and upland tussock grasslands and subalpine zones in the north-western part of the South Island. Now confined to three discrete populations, in northwestern Nelson and North Westland; in the Paparoa Range; and in the Southern Alps from just south of Lewis Pass to just south of Arthur’s Pass. 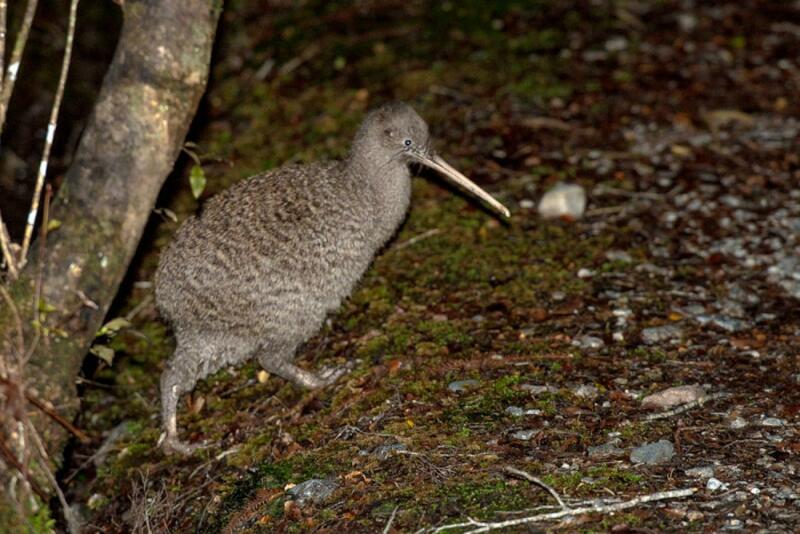 A new population has been established near Lake Rotoiti, Nelson Lakes National Park, and very sparse or recently extirpated populations in the Flora Valley (Arthur Range) and Nina Valley (near Lewis Pass) have been supplemented by recent releases. At the time of European settlement they had a similar distribution, except that the Paparoa Range and Southern Alps populations probably linked in the Grey Valley. Previous records of great spotted kiwi from Westland south of the Taipo River probably refer to hybrid rowi x little spotted kiwi. 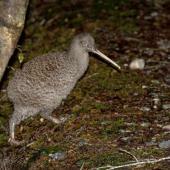 About 15,000 birds in 2012, with about 55% in Northwest Nelson, 30% in the Paparoa Range and 15% in the Southern Alps. 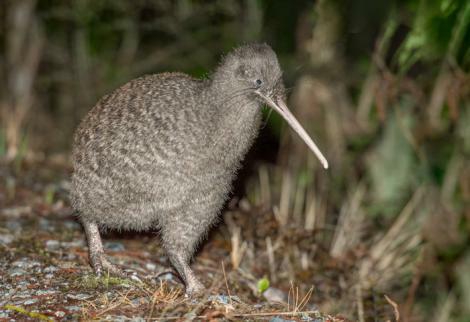 Great spotted kiwi have disappeared from many lowland sites around the fringes of their distribution, and from the Grey Valley, presumably through a combination of habitat loss and predation by mammalian predators, especially dogs and stoats. The very wet upland and subalpine areas they mainly occupy have lower densities of mammalian predators, and this may have allowed great spotted kiwi to remain locally common in some sites. Hourly call rates across the whole range is slowly declining, but landscape scale management of predators through periodic aerial 1080 (sodium monofluoroacetate) operations, or trapping, may have slowed or reversed the declines in some areas. The removal of eggs or young chicks from the wild and the rearing of chicks and juveniles in captivity or in predator-proof crèches, until large enough (1.2 kg) to cope with the presence of stoats, has allowed some populations to increase. Eggs are laid from July to December. The nest is in a short burrow, rock crevice, hollow base of a tree, or in a hollow log. Clutch size is 1 very large white or pale green egg. Incubation is shared by male and female, with the male doing most incubation by day, and duties are shared through the night. 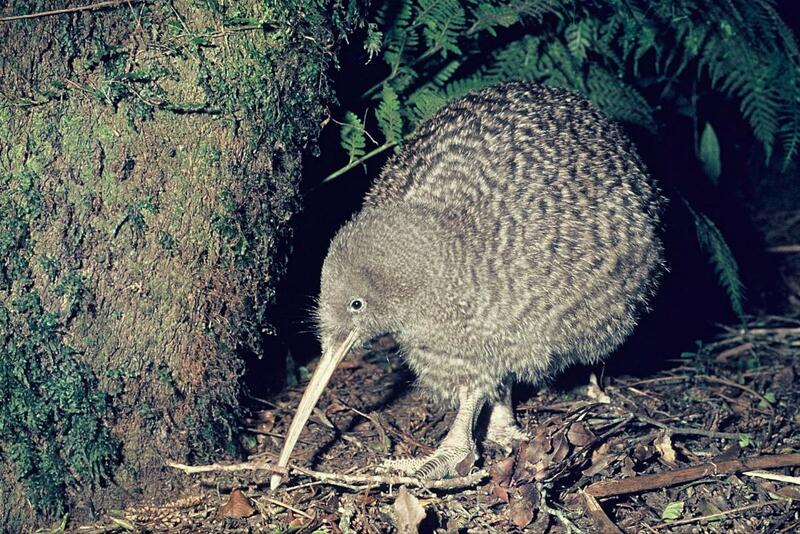 Great spotted kiwi are flightless and nocturnal. During the day they rest in a burrow, rock crevice, hollow tree or log, and emerge shortly after nightfall. Feed by walking slowly along tapping the ground and when prey is detected they probe their bill into the leaf litter or a rotten log; occasionally plunge their bill deep into the ground. Call occasionally each night to advertise territory and to maintain contact with partners; often duetting pairs will interrupt the call of their partner, so male and female calls are alternated. They are fiercely territorial, and fight conspecifics with their sharp claws, resulting in a cloud of feathers on the ground. 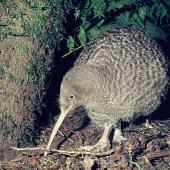 Great spotted kiwi eat mostly small invertebrates, especially earthworms and larvae of beetles and cicadas; they also eat centipedes, spiders, beetles, weta, snails and freshwater crayfish. Some small fallen fruit and leaves are eaten. McLennan, J.; McCann, T. 2002. 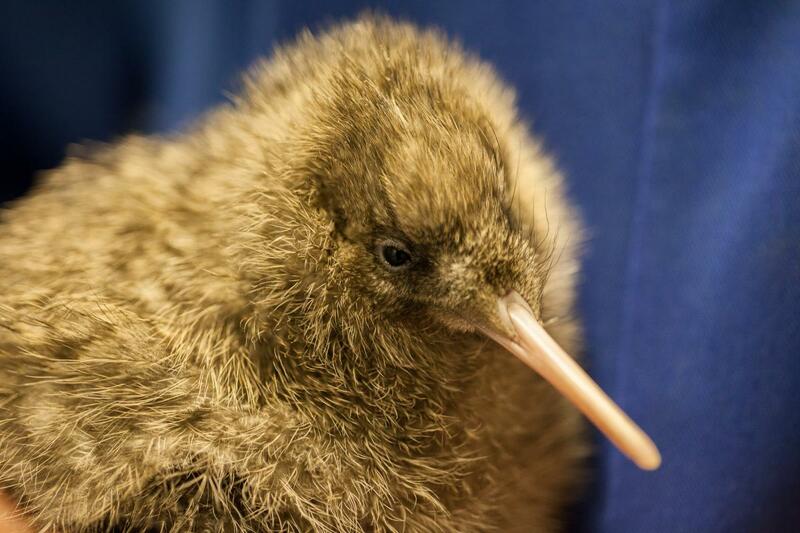 Genetic variability, distribution and abundance of great spotted kiwi (Apteryx haastii). Pp 35-56 in Overmars, F. (ed.) Some early 1990s studies in kiwi (Apteryx spp.) genetics and management. Science & Research Internal Report 191, Department of Conservation, Wellington. Robertson, H.A. ; McLennan, J.A. ; Colbourne, R.M. ; McCann, A. J. 2005. 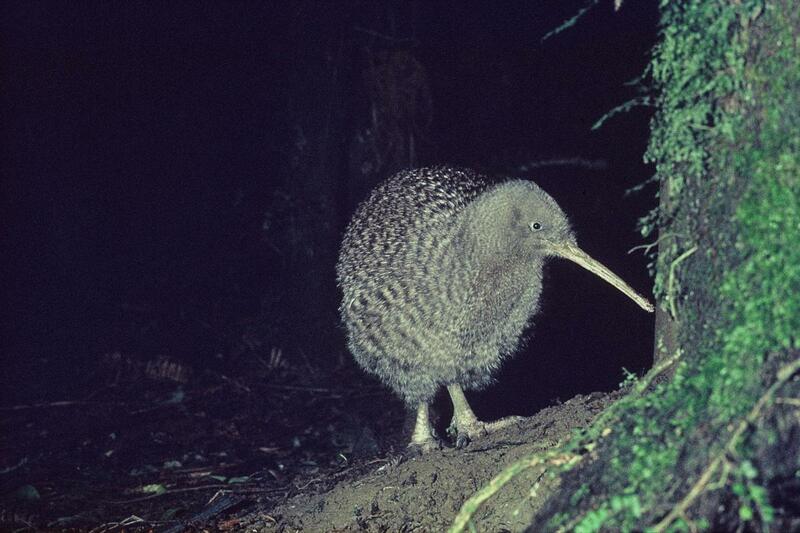 Population status of great spotted kiwi (Apteryx haastii). near Saxon Hut, Heaphy Track, New Zealand. Notornis 52: 27-33. 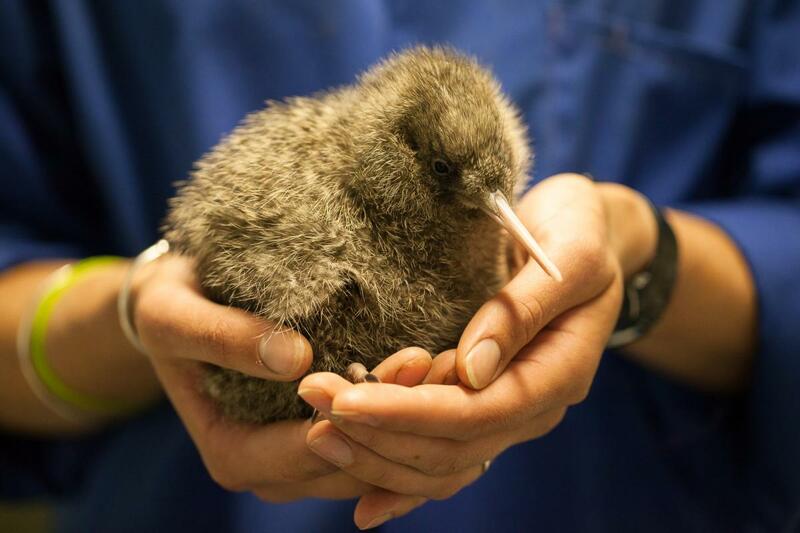 A large pale kiwi with brownish-grey finely mottled feathers or banded horizontally with white, a long pale bill, and short dark legs and toes often with dark or dark streaked claws.